Successfully Added MJX Bugs 3 Drone - Brushless Motors, Two Speed, 6 Axis Gyro, 850mAh LiPo Battery to your Shopping Cart. This quadcopter from Mei Jia Xin Toys (MJX) is their first to feature brushless motors and is a cross between a camera drone and a ready to fly race or sports drone. The 1306 2750KV brushless motors provide a great lift and awesome power. With the 850mAh LiPo battery, you can enjoy around 15 minutes of flight time. It has a high and low-speed flight mode so is good for those just taking to the skies as well as experienced aerial acrobats. If you want to unleash the beast then flip to the high-speed mode and put this drone through its paces. 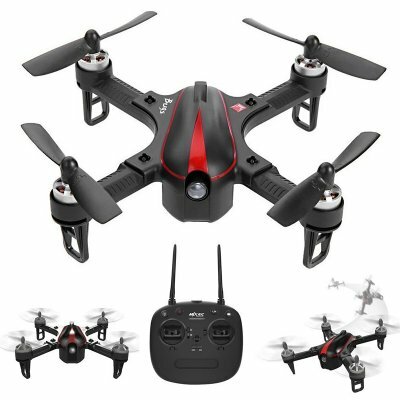 You can perform 3D flips and the responsive controls, lack of altitude hold and brushless motors keep them nice and tight. A 6 axis gyro keeps the drone stable and it can be controlled from over 200 meters away due to the strong 2.4Ghz remote control that operates on 4 channels. With an LED light on the front, it's easier to locate and direct the drone even in lower light conditions. If you're ready to learn to fly and want some thrills then the bugs 3 drone is a superb choice. You can use the Bugs 3 for aerial photography as well. While it doesn't come with a camera it does have a camera mount so you can attach a GoPro or similar action camera to the underside. The Bugs 3 drone comes with 12 months warranty, brought to you by the leader in electronic devices as well as wholesale quadcopters and camera drones..